Are you looking to convert your regular 24” - 26" single speed Mens bike, cruiser or a multi speed mountain bike into a motorized bike or moped? 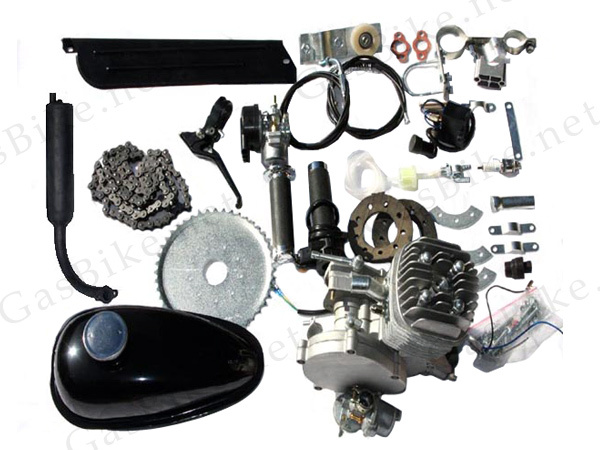 Then this bicycle motor engine kit comes with everything that you'll need! You will be able to stop or start the engine as you ride. There is no rope pulling needed and it gives more speed and gets around 150 miles on a gallon of gas. Please Tell a Friendabout this product and help spread the word about Motorized Bicycles. Get your Silver Slant 80cc bicycle motor kit now, while supplies last at this price... Wholesale Jet 80cc Bicycle Motors can be made here. This engine features a 45 degree angled spark plug and include a steel intake manifold, with a larger inner diameter for improved performance. This engine has a 1 3/8 (1.375) inch diameter downtube engine mount accomodating the most common bicycle frames. Higher grade nuts and bolts are used throughout the entire engine. Improved fuel line quality is included with these kits that don't get hard over time. Strong gas tank clamps are now packaged which help create a secure bracket mount for the gas tank to the frame of the bicycle. The gas tank mounting bolts measure 1 1/8 (1.125) inches long and a spring loaded gas tank cap is included. Stronger and more durable idler wheels, and a quieter and more fluid roller system. The hemispherical (half-circle) endcap and larger exhaust pipe diameter make for a smoother-running, more powerful engine. A catalytic converter has been pre-installed and is included within the exhaust muffler. A clamp for holding the Exhaust Muffler to the frame of the bike is included with this package. The clutch removal tool is included with this package and will definitely come in handy for maintenance down the road. The muffler support design has been improved. The large frame tube adapter accommodates up to 2 inch diameter down tubes. These packages include an extra pack of spare parts including 2 x Exhaust Gaskets, 1 x Master Link and Keeper, 1 x Rear Engine Mount, 1 x Rear Engine Mount Clamp, 1 x Spark Plug. These items alone are valued over US$20.00. This complete bicycle engine kit package comes with every thing that you'll need to convert any regular 26" single speed or multi speed mountain bike into a motorized bike. You'll still be able to pedal the bike and ride like normal or start the engine by releasing the clutch lever. There's no rope pulling needed. You can stop or start the engine as you ride. Twist grip hand throttle controls speeds from 38 to 53/kmph depending on the gear ratio. This installation kit comes with a 44 tooth 9 hole sprocket with easy to install 9 bolt universal mounting hardware that clamps over the rear wheel hub and spokes. This creates a totally independent drive sprocket and chain that does not interfere with your current drive chain or pedalling.